Talon’s Point of the Day – June 26th, 2015 What Happens When There Are No Rules That Apply To You? What happens when there are no rules that apply to you? You can justify your previous wrongs by simply becoming your own rule maker. 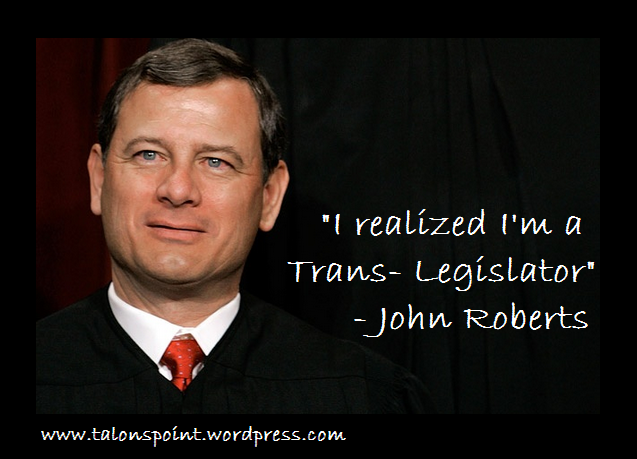 Thank you Chief Justice John Robert! I’m sure we’ll all get to make our own rules now, right? Now that we have not only peeked inside Pandora’s box (or jar to be mythologically accurate), but actually smashed it with society’s sledge, I ask this question: Are we really a more civil and enlightened people? While I’m no fan of discrimination or the false claims thereof (more on this in a moment) I cannot agree more with Hoenig. Though I cannot speak for Mr Hoenig this makes neither he or myself racist. In fact I’m pretty sure Mr Hoenig services customers of all colors and creeds as do I. What it does make us is two of the few who recognize that to protect liberty of all, we must protect liberty of those who will sometimes act on those views in ways we might personally disagree with. It’s not that discrimination is necessarily right or justifiable. It’s that the empowerment of government to prevent marketplace discrimination (not connected to direct survival) inevitably results in stripping someone of their personal liberties, and we are all “someone.” This empowerment of the agents of force to prevent actual (and now perceived) discrimination sounds good to the weak minded, but in reality it empowers those who feign lamentations of “discrimination” in order to enact control over the free will of those whose views they find offensive, thus turning government into a tool of discrimination against the free exercise of liberty itself. Now let me clarify, there are in my opinion a few critical limitations, or better said “clarifications,” to this view. Our right to personal liberty ends when the act of engaging in our personal liberty brings actual harm to others. While I do not agree with how our federal government addressed the civil rights movement, there is no doubt in my mind that certain protections had to be provided to America’s blacks, at least in certain areas, so as to allow the simple right to life itself and liberty. In other words, the personal liberty of racists (whites in our example) to be racist is sacrosanct under our Constitution so long as the practice of their racism does not extend to the safety or basic survival of others (blacks in this case), through denying or impeding access to public safety services, hospitals, food, public schools, and other govt subsidized services (a discussion for another day). Beyond that the best solution should have been to allow market forces to eventually bring repercussion on racists who used their businesses to generally inconvenience blacks. The consequence of empowering government to use strong arm tactics to “right a wrong” is now being seen in the metastasized cancer of “gay rights” intimidation tactics by what has been dubbed “Gaystapo” activists and their mindless lackies in the media, and elsewhere. The refusal to provide a non critical service for religious reasons has now conveniently been painted as racist by the Gaystapo because of the observations of “successful” past misuse of government force during the civil rights era. But where has freedom gone? Have we so devolved intellectually that the refusal to bake a sugar laden coma inducing confection is automatically assumed to be “hate?” And even if it could be proven as “hate” how is the person refused service actually harmed and worthy of government intervention on their behalf? Are there really anorexic homosexuals so in need of calories that they must use government force to assure their survival because only Christian operated bakeries, and now pizza restaurants, can provide the critical sustenance they need? Of course not. In our materialistic consumer driven society where the dollar is virtually worshiped there is simply no limits on where any of us can get a cake made, a hot pizza served, pictures taken, food catered, a dress made, or facilities rented, etc ad nauseam. We’re not talking about denying emergency room services here. We’re not talking about denying fire department services, police services, publicly traded (more in a moment) businesses operated residential rentals, public utilities, and banking services, education, or food. I’ll grant there are gray areas consisting of clothing and transportation fuel, perhaps a few others, but even in these cases we are at a place in our society where the market will likely provide to anyone with the money to pay everything they want, let alone need, even in a small market. There is also the issue of business activities of publicly traded companies. These companies are arguably required to serve anyone regardless of the views of their controlling entities due to legal fiduciary responsibilities. Aside from this we all are better off protecting the rights of privately held businesses to make the likely poor business decision of “discrimination,” especially as they seek to compete with much larger publicly traded businesses who will be tapping the market of blacks, or in this case homosexuals. If these privately owned businesses make decisions the public at large deems unjustifiably prejudicial, the public will punish them by taking their dollars elsewhere and the business will either adjust, or accept it’s diminished market share, reserved only to those who agree with their publicized views. So let them eat cake whomever they are. But let the market decide who puts the dough in their oven, including those who decide they don’t want the job. Follow up: Mark my words supporters of ISIS and other Islamist terrorists living in the U.S. (they exist by the thousands) are watching how this plays out and soon will publicly force patriotic Americans to provide materials expressing this support. China, Russia (I know, they claim to no longer be communist) and other communist nations torture and murder their own citizens for believing in God and you think America and Europe’s power hungry communists, ie socialists, ie democrats wouldn’t secretly love to do the same? Eat your own words, Debbie Wasserman Schultz! …. and to someone who thinks the solution is to simply vote GOP as if GOP wins have advanced liberty rather than the reality it has also attacked it…. For several years now I’ve said that Obama may turn out to be the best thing that has happened to America both spiritually and politically in several generations. How can I such an astounding thing? Because before Obama, our once great nation was not only sliding into the spiritual and social abyss, we were doing so in our sleep. The rise of this developing tyrant has awakened the portion of America that is capable of consciousness. The other portion is of course suffering from a government sugar induced coma and won’t awake until they are dying from their coming real physical hunger. Obama’s acts have driven the Godly, and many of the once Godly, to their Bibles and their knees. It has been the fulcrum that has wedged them out of their actual, and metaphorical, recliners and motivated them to reestablish or strengthen the faith they will need to stand through the coming storm. It has even awakened some who never gave God much thought but deep inside they knew spiritually there is no hope outside of the the Creator they previously disregarded. This storm will almost assuredly include open persecution of Christians, and to a lessor extent non conformist non-Christians who reject all intrusive government, not just anecdotal cases of persecution but full scale legalized persecution both sanctioned by, and engaged in by all levels of government. I pray this is not true. But every sign tells me otherwise. Let me quickly say here that I am not opposed to government. 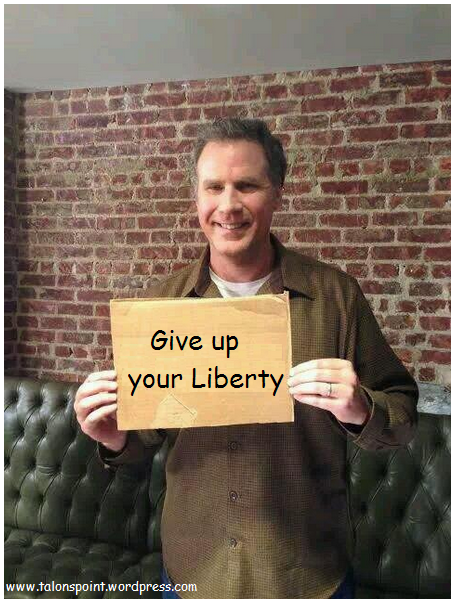 Our founders were right that it is a necessary evil that is best limited but nevertheless needed. Yet it is most capable of acting honorably when it acts minimally. Secondarily, as I have already eluded to, it has awakened non-Christians at a political level. People from all walks of life, even some “liberals” who now justifiably fear they will soon lose all remaining social liberties in exchange for a system that takes virtually all they have and returns to them over priced and poorly provided “services.” Services that do not compete with what the free market is capable of. They recall images of empty Soviet market shelves and instinctively know we are walking the same path that led to mass economic deprivation. Neither of these two awakenings, in my opinion, would have occurred under under John McCain because it was not occurring under George W. Bush. I’m not attacking these men. I am however confidently contending that their big government views intentionally, or unintentionally, have, or would have in the case of McCain, allowed the exponential growth of a government that displaces God with itself. I further contend that had Romney been elected, we likely as a people would have returned to believing this threat was generally over. As such we would have gone back to sleep as the assault on our spiritual heritage and personal liberty would continue unabated, just slower. Not because of Romney per se, but because the structure that allows the assault would only have been tweaked, rather than reformed.